If you’ve read the novel, you will realise that the sequel is based loosely on the novel. Which is pretty good, because I wasn’t exactly happy with how the novel went. Most of the important scenes were taken in, and the landscape was jaw-dropping. I saw some online reviews on how this film didn’t have any “maze”, but ain’t the Scorch itself a maze? They didn’t know where they are going, who they will bump into, enemy or friend… #LifesAMaze If you have not read the novel, it is almost impossible to anticipate what might happen next. The journey is a maze, it’s an adventure that you will have to go through with the team, reminding me of the game “Temple Run” where the character has to constantly escape from monsters which resembles a mixture of the Grievers (from first movie) and the Cranks (from the sequel). And as the player runs, the landscape changes, exactly like how the bunch of guys move from desert to ruins and then to abandoned towns. (Useful Spoilers in This Paragraph) The suspense was good. The action sequences were crazily scary but not over-the-top. Think racing up a toppled ruins of skyscraper while being chased by zombie-like Cranks. Or going underground to the tunnels, knowing the worst kind of Crank are out there, but yet that’s the only way out. However, my favourite scene, (something similar to the above) was when they had to abandoned a badly injured and infected mate, only to stop when they heard the gunshot. The sadness in that silhouette, the pause before moving on, the scene was beautifully done. I guess what surprised me the most was the choice of cast. The cast were diverse (or should I say multi-racial) making every individual unique and well-defined. The new characters, such as Rosa Salazar (Brenda), Jacob Lofland (Aris Jones) and Jorge (Giancarlo Esposito) were interesting additions to the film. While I’m usually resistant to new additions to existing characters and plot, these people made the originally strong team a little more fun and funny! I like how the film gave just a slight hint of romance, instead of emphasising it like the novel – after all, who has time to do the lovey-dovey stuff when everyone is on the run! The only disappointment I could think of, was perhaps, the 130minutes film leave you wanting to watch on. As the second part of the trilogy, it is an arc to the whole picture, and audience (especially those who did not read the novel) will end with “What? That’s ALL!” instead of “Huh? What Just Happened?”. This is definitely much better than The Hunger Games: Mocking Jay Part 1. So yes, it’s a MUST WATCH! P.S. Catch “the Maze Runner” movie before watching it or you won’t understand what they are talking about. The characters development were mostly done in the first film. In this sequel, it’s a lot of suspicion and fleeing! Instead of waiting to see the box-office, the studio decided two weeks before the premier of the Maze Runner film to greenlight The Scorch Trials as the publicity and reviews were overwhelmingly good.The director Wes Ball says the movie will diverge from the book a little bit, but will get back on track in the third installment titled The Death Cure. Thomas-Brodie Sangster, Aiden Gillen, and Nathalie Emmanuel who appear in Game of Thrones (2011) are in this film Australian actress Adelaide Kane was fancasted to play the role of Brenda but couldn’t get the part due to scheduling conflicts. There are numerous differences between the novel and the movie. In the book, the team were forced to either be killed or go out into the Scorch (as the next trial), while in the move, they escaped into the Scorch as when they found out that the whole set-up and that they were still under the control of W.C.K.D. In the novel, Teresa was separated from the boys for most of the time, and grouped with the girls, communicating occasionally via telepathy. However, in the film, Teresa was with them the entire time. Check out Maze Runner: The Scorch Trials Official Website and Facebook Page! 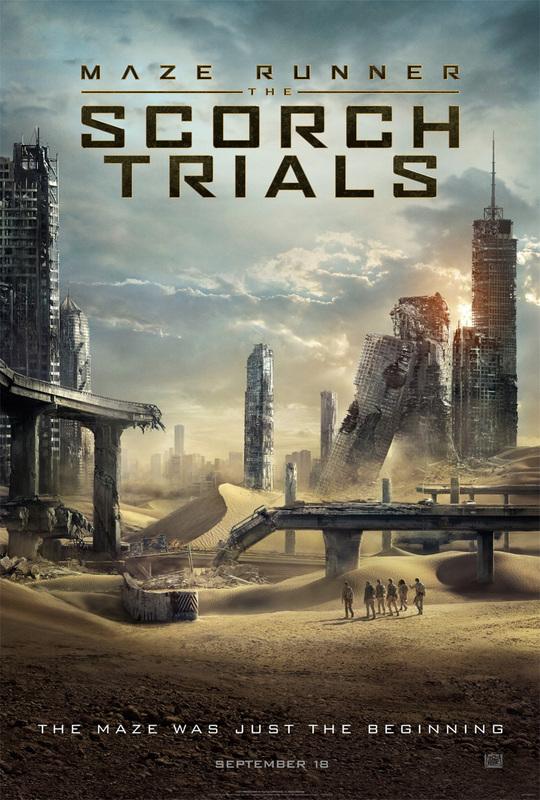 Maze Runner: The Scorch Trials is out in cinemas on 10 September 2015. My mom saw the first Maze Runner movie and she loved it. And somehow, no matter how much she suggested I watch it, I’m not that interested. I’m sure she’ve watched this already. And even if she finally convince me to watch it, I will have to watch the previous to fully understand. The maze runner was a great movie. It’s nice to see how things continued after the first one. My son loves the series and have read all the books. he’s bugging me to take him to this film asap. good to know you liked it. BUT how can they not seperate Theresa! That was central to the developement of the story in the book! I read the novels too, and learning here that Teresa would be with them the whole time is interesting because that would change things. I heard quite a number of good reviews about this movie. Though I am not familiar with the cast but as you me mentioned that this is definitely much better than The Hunger Games: Mocking Jay Part 1. I will watch it this weekend. I never really got into the first movie. My husband will probably drag me to see this weekend though. I actually just watched the 1st film a couple of months back, didn’t even know about the book series. I was totally impressed with the 1st one that I wanted the next to be released soon as I finished watching haha. Wow, you gave it a high rating! Definitely going to see The Scorch Trials! Your review looks so brilliant and i think was thinking when i should go and watch it but now surely catch up. My two teen children are dying to see this movie! Thank you so much for the review — I might have Dad watch it with them for a kids’ night! It seems almost everyone online are talking and reviewing about this movie. I haven’t watched this one yet though but I might give this a go. wanted to catch this last weekend but couldn’t find time to. will probably watch it this weekend! can’t wait! ps. i really like that cute korean guy. heh! Thanks for reviewing this movie. I have been so curious about it since everyone’s talking about it. What an interesting and comprehensive review. It’s nice to read it – as I was curious about how the movie turned out. I didn’t see it (yet, at least), but I read the books.